New England Patriots owner Robert Kraft and Foxborough High quarterback Mark Clagg. Cathy Roche, a Massachusetts native who teaches nursing at the University of Alabama at Birmingham, had something to add to the story. “My nephew Mark Clagg,” she wrote to us, “is Johnny Foxborough.” She even passed along a highlight reel of the Foxborough Warriors’ 5-foot-10, 170-pound quarterback throwing touchdown passes and scrambling for big gains. Did we want to talk to him, she wondered? Turns out, Johnny Foxborough has a story of his own. 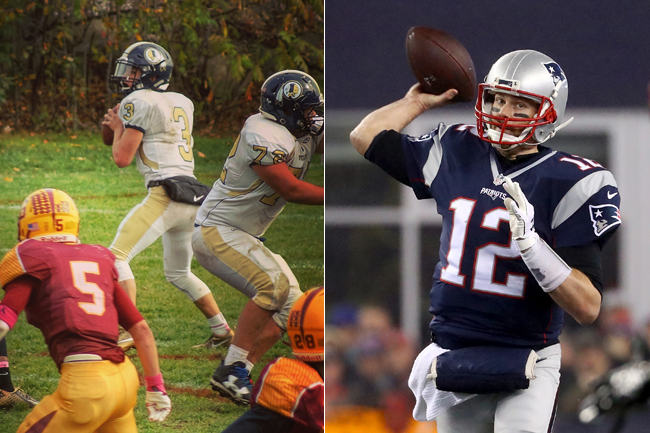 Foxborough High quarterback Mark Clagg (l.) idolizes Patriots QB Tom Brady. Foxborough High is less than five miles from Gillette Stadium, through a state forest and down Main Street. Its proximity to one of the most successful sports franchises makes for atypical small-town New England living. Eight Sundays a year, you don’t venture outside the neighborhood because of stadium traffic. And students who go door-to-door selling school fundraisers often find a willing buyer at Julian Edelman’s house. A whole generation of teenagers can say their sports idols work just up the road. Mark Clagg started out as a lineman at the Pop Warner level. During his freshman year of high school, one of his coaches moved him to quarterback. His mechanics were a little rough that year, so he spent the next summer being tutored by Tyler Grogan, the son of former Patriots quarterback Steve Grogan. The Claggs and Grogans were neighbors and friends. Mark never missed a football practice during his four years at Foxborough High. When he applied to colleges this year—he wants to major in business and maybe play Division III football—the district’s superintendent wrote one of his recommendation letters. His senior year, he was unanimously voted captain of the football team, in large part because he never loses his poise. During his junior year Thanksgiving game against rival Mansfield, Foxborough trailed 12-0 at the half. Clagg led the comeback, scoring through the air and on the ground. Late in the fourth quarter, he lobbed a touchdown pass to a leaping receiver to secure the win—it’s the first play on his highlight reel. When Mark was 4, his father, Jack, instituted a motto in their household: You can’t control the things that happen to you in life, only how you react to them. That was in 2002, the calendar year when the Patriots won their first Super Bowl and when Mark lost his mother, Nancy, to breast cancer. That was on Jan. 19, 2002. Two weeks later, they screamed their heads off at a neighborhood party for Super Bowl 36. Seven months after that, Gillette Stadium opened and Nancy had planned to be in their new seats—13 rows behind the Patriots’ bench, near the 12-yard-line—but she wasn’t strong enough to go. She had beaten cancer once before, in 1995, when she was already a mother of three. She was young, a marathon runner, with no family history of breast cancer—but she found a lump in her breast. She had a lumpectomy and radiation treatment and went into remission. A few years later, in October 1998, she and Jack welcomed a fourth child they weren’t sure they’d be able to have. They named him Mark. Nancy Clagg died of metastasized breast cancer when her youngest child, Mark, was 4. Now the quarterback and shooting guard at Foxborough High, Mark always wears her initials on his cleats and shoes. Over Labor Day weekend, in 2002, Nancy and Jack were out for their usual three-mile morning walk with their two Labradors when one of the dogs yanked on the leash. Nancy thought she pulled a muscle in her back, but the pain wouldn’t go away. She saw a doctor, and that’s when she found out: The cancer was back, and it had metastasized to her liver, brain and lungs. When she began going to chemotherapy treatments, Jack says his wife looked like the healthiest person in the waiting room. As the weeks passed, that changed. The cancer was too aggressive, too widespread. Eleven weeks later, on Nov. 19, she died at 40. Jack, a general manager for an auto group in New England, raised their four kids on his own. His neighbors, including Steve Grogan and his wife, Robbi, helped with meals and rides to practices. Sports, which had been central to the Claggs’ life before Nancy’s passing, were even more important afterward. Foxborough High quarterback Mark Clagg and his coach Jack Martinelli. A week before the Super Bowl, the Claggs got an answer. The Patriots had heard about the real Johnny Foxborough and reached out to Mark’s football coach. 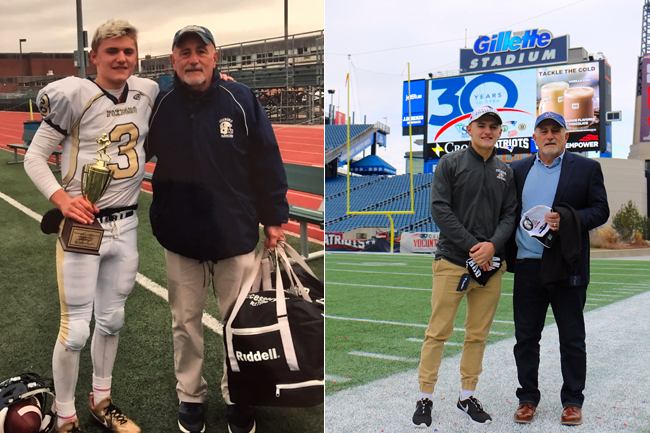 A week before Super Bowl 51, on the Sunday afternoon before the Patriots departed for Houston, Clagg and his coach were invited to Gillette Stadium. To the Patriots, the nickname is an anonymous metaphor, but for the actual quarterback at the high school down the street, it’s much more.